I just got some weird news from our buddy Nate over at CPO Outlets. 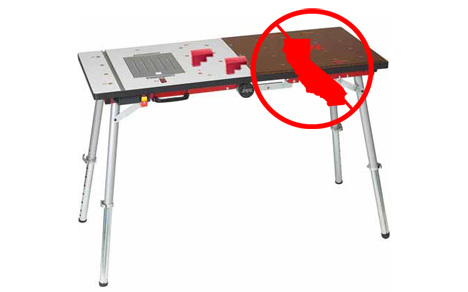 Starting July 1st, SKIL will no longer sell or ship their X-Bench Portable Workstation to the state of California. Due to a new environmental law passed in the state, the X-Bench no longer meets the California standards. This is all because of the MDF top that is part of the X-Bench, and its use of formaldehyde. To make a long story short, during aftermath of the disaster that was hurricane Katrina it was determined that formaldehyde could “leak” from the MDF made FEMA trailers when it was exposed to extreme heat and humidity. Because of this, California has changed their standards for Air Toxic Control Measure for Composite Wood. SKIL will not be issuing a recall for the X-Bench because it was in full compliance with the state during the period of sales. If you wanted to get an X-Bench, you better hurry while you can. All remaining X-Bench stock in Cali. is required to be returned to SKIL. A successor to the X-Bench has been in the works and will be available in late July, but it is not a direct replacement to the X-Bench, and will not be at the same price point. It will be interesting to see what other products will be affected because of this. The Festool MFT for example. "Thank you for inquiring about the Festool MFT and requirements for sales in California. We are investigating the matter currently as it applies to our MFT product and should have an answer forthcoming shortly." So there you go; we will all just have to wait and see what happens next. As a resident of California, I am plenty aware of how the state is apt to pass laws and regulations without thinking of the impact or consequences. I think this regulation just might be one of them. I hardly consider California to be a hot and humid climate – Hot, yes, but hardly humid.